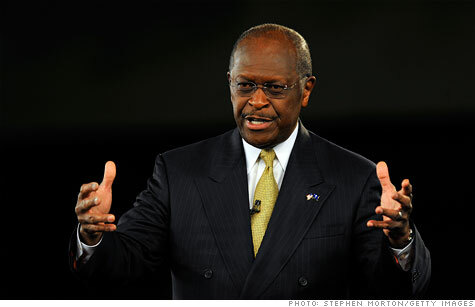 Herman Cain wants to scrap the tax code for his 9-9-9 plan but eventually move to a Fair Tax. NEW YORK (CNNMoney) -- As you may have heard, Republican presidential candidate Herman Cain has a tax proposal he calls the "9-9-9 plan." He talks about it ... a lot. And he has generated a lot of attention for it. The 9-9-9 plan would get rid of almost all current taxes and replace them with a 9% income tax, a 9% corporate tax and a 9% national sales tax. Ultimately, Cain wants the country to adopt a Fair Tax. He's not the first presidential candidate to propose it. In 2008, for instance, Mike Huckabee made it a central part of his economic plan. So what's a Fair Tax exactly? In essence, it's a national sales tax that would replace the current tax code entirely and all the credits, deductions and exemptions that go along with it. With a national sales tax you would pay federal tax on what you spend rather than on what you earn, save or invest. The idea is to make the tax system less of a hindrance to economic growth. Herman Cain's 999 tax plan: Break for the rich? "Income taxes, by their nature, double tax savings and investment, which imposes a large deadweight or efficiency cost on the economy," former Treasury Department official Bruce Bartlett said at a House Ways and Means Committee hearing this summer. Cain hasn't offered any specifics on how he would set up a Fair Tax. But here's how the general proposal put forth by Fair Tax proponents would work. You would pay what amounts to a 30% tax on top of the price of anything you purchase. So for something that costs $1 you would pay $1.30. The extra 30 cents represents 23% of the final purchase price ($1.30). That's why you will hear Fair Tax supporters say that the tax rate under the Fair Tax is just 23%. A Fair Tax, like any tax that applies across the board to everyone regardless of income, would hit the poor harder than others. To correct for that, all taxpayers would receive a monthly rebate check equal to what someone at the poverty line would pay under the Fair Tax. That would mean poor people would get back the tax they paid in. Tax experts have questioned whether a nominal 23% rate would be high enough to ensure the Fair Tax system raises as much revenue as the current system. "Every serious effort to score the Fair Tax by the Treasury Department, Joint Committee on Taxation and the Brookings Institution has concluded that a rate significantly higher than 23% would be necessary for it to be fiscally neutral," Bartlett said. And if lawmakers exempt anything from taxation, that could push the rate higher as well. Experts have also expressed serious concern about both the administrative complexity and potential for tax evasion in terms of how the Fair Tax would interact with state and local taxes. Class warfare: Who pay's their fair share of taxes?